Starting in 2006, Wizards of the Coast introduced a series of silver-bordered foil cards given to staff and business partners. Each year's card is different and is and all of them are valuable and relatively expensive. By that, I mean above $60 each or more. Gifts Given is named after the card Gifts Ungiven. Snow Mercy is named after the card No Mercy. 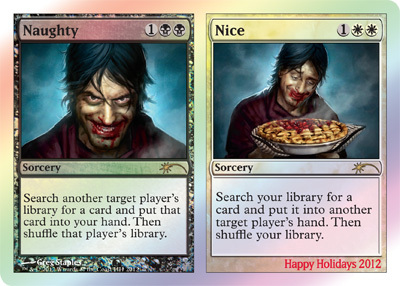 Naughty//Nice is based on the many split cards from Magic's history. 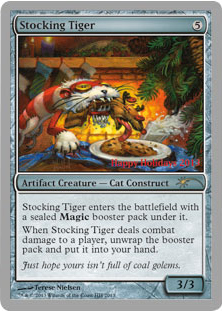 Stocking Tiger is named after Stalking Tiger. 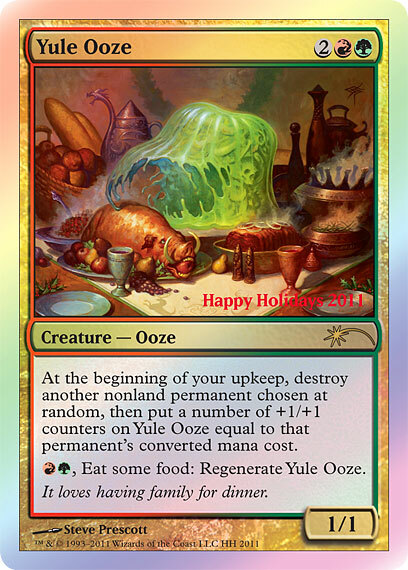 We will find out the 2014 card sometime in December of this year as per usual.